The one bit of advanced prep you need to make for this smoothie is to slice and freeze a banana. As I said, I'm going to have to stock my freezer with this from now on. For one serving, I used a medium banana. Obviously, for more sweetness, go with a riper banana. Mine was about middle of the road, not too ripe but not hard. Then, you add a tablespoon of cocoa powder and about 3/4 cup of skim milk (or whatever milk you prefer). Blend until smooth, adjusting the consistency with a little more milk if you need/prefer. Pour it into a glass and enjoy. I sure did! My son had a sip and thought it was pretty good. I can't wait to make one for my husband; I have a feeling he'd enjoy it as much as I did. Have a great day and enjoy the upcoming weekend! Place all 3 ingredients in a blender and process until smooth. If necessary, adjust with additional milk. Pour into a glass and enjoy! I don't drink smoothie regularly..mostly because they are usually over loaded with fruits. But this one seems quite light yet very healthy and delicious, Monica. I'm not a huge smoothie drinker (I love chewing on things and prefer to chew my calories) but hubby is a huuuuge smoothie drinker! You said it, Lorraine. I am in your camp but I really enjoyed this easy little smoothie and for the sake of variety alone, it's a nice mix up. When I crave a milkshake, I know what to do now. We love smoothies - but I always freeze my fruit so I don't have to water it down with ice. This sounds completely wonderful and I know we would enjoy it! Tasty and beautiful! I make lots of smoothie mainly during summer, not so much during cold weather...I like the idea of e ingredients...and so tasty. It's nice to make truly healthy smoothies at home...you know just what you're putting in and getting out of it. Thanks for swinging by, Juliana! 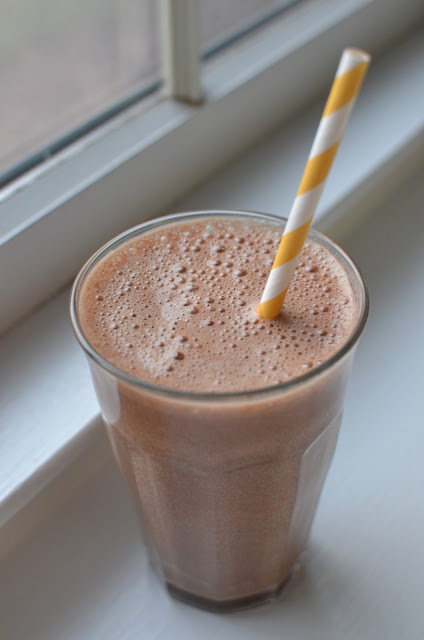 I am a big fan of smoothies and love this chocolate banana version! Only 3 ingredients sounds perfect to me too, my kids would slurp this down in no time :) So simple and easy! Happy Friday, Monica! I know you could teach me so much about smoothies! Right now, this 3-ingredient type situation works for me but who knows...maybe I'll 'go crazy' and branch out further one day. : ) Have a great weekend, Kelly, and congrats on your upcoming cookbook!!! haha as you know, I most definitely smoothie!! 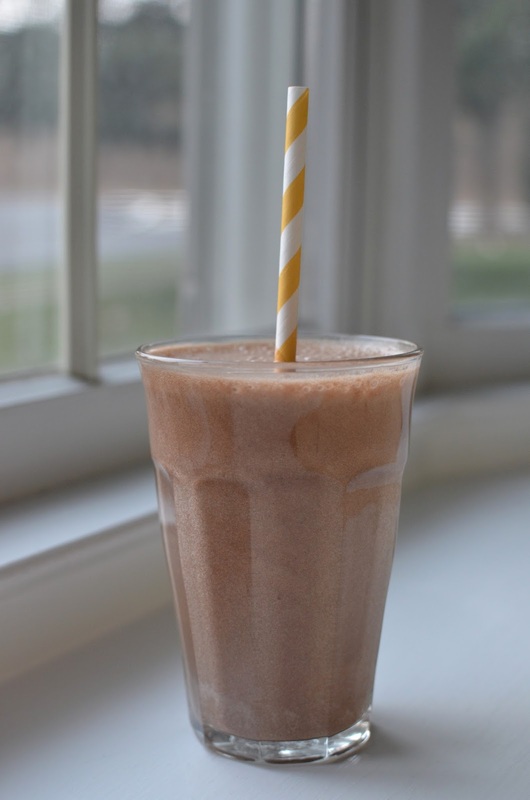 :) I love how simple this one is - I really don't use banana enough in smoothies! I should switch it up more often ... I have pretty much 3 smoothies that I just switch between! Chocolate and banana go SO well together! This smoothie looks delicious! Right! It's almost a no-brainer...not sure why I was so surprised I liked it so much. I guess I was afraid of that kind of frozen banana taste that is different from eating it whole/fresh. It was a treat though and I'm going to be sipping this again soon. Have a great weekend, Medha. I could start my mornings out daily with this smoothie, love that you only used 3 ingredients Monica, looks delicious. So easy, I had to try it and glad I did. Enjoy the weekend! Yes I do but I have never made one with chocolate. I guess I have to show this post to my daughter. 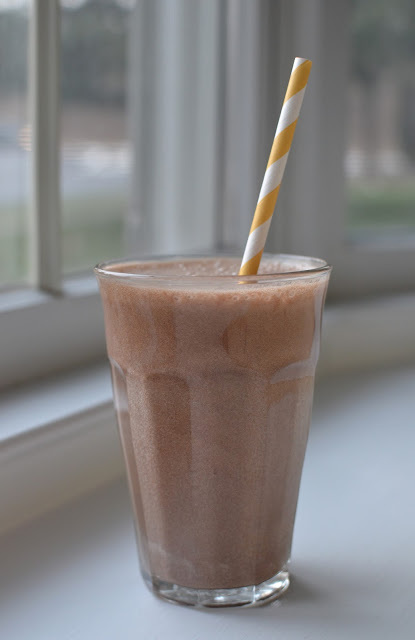 As a matter of fact we do make smoothies very often and this recipe is one of our favorites. You feel like you are really being naughty but it is pretty healthy. Loving your bright and beautiful photos. Great lighting...! I was lucky with good natural lighting the other morning. : ) I bet you make some inventive smoothies. This one did taste like a decadent treat...I think that's why I was so happy.